Oh, hey. Illinois Republican Senator Mark Kirk tried to make a joke. That’s — that’s odd. Why do these dudes think they can make jokes? Don’t they have supportive family members or colleagues or close friends to gently take them aside and say, “Senator Mark Kirk, my man, you’re surprisingly OK for a Senate Republican but you are really not a funny guy”? Can’t really be mad about this one. In the vast spectrum of obnoxious or truly terrible things that Senate Republicans do — sabotaging nuclear talks with Iran, trying to ban abortion in every sneaky underhanded way they can think of, the fact that Lindsey Graham just introduced a 20-week abortion ban — joking about hos is pretty low down on the list. 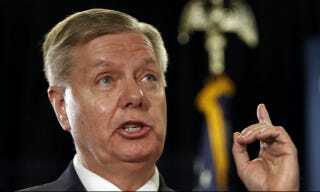 Graham, meanwhile, claimed today that a federal court would uphold the 2o-week ban, if it ever passed into law. ““I think science is on our side and I think law will be on our side,” he said. But, uh, no: A federal appeals court struck down Idaho’s virtually identical law last month, and, as the Hill points out, the Supreme Court declined to hear Arizona’s case when they appealed their own 20-week law getting thrown out. So Senate Republicans maybe don’t have such a good grasp on science, the law, or jokes.